Join Our Growing List of Sponsors Helping Us Green Area Events! We’re fortunate to live where we do on the shores of the Chesapeake Bay. We have a responsibility to be good stewards of our land and waters when we’re at home and on the go. Each year countless regattas, festivals, races, and other special events are held in our area, creating a lot of waste. Event planners find that Greening an event is often difficult, confusing and expensive. With your help, Annapolis Green can change this. A team of willing event organizers, host sites, sponsors, and attendees can turn the tide away from waste. 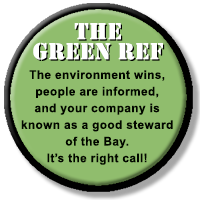 “Responsible Events & Festivals… Make the Right Call” (The Green REF) is a program we've designed to help area special events reduce waste and Go Green. The program includes not only collection and hauling of the waste but the very important public education component. From brightly branded waste bins, supplies, training, messaging and public outreach, we have helped make a huge difference in our community assisting event organizers, sites and attendees be more responsible while out having fun. Our REF program is based on sponsorship. We look for companies - in any sort of business - that would like to Make the Right Call and connect their brands to our recycling and composting educational efforts. Sponsorship makes it possible to cover the expenses associated with making these good things happen! When we started this several years ago there were almost no recycling opportunities at special events. 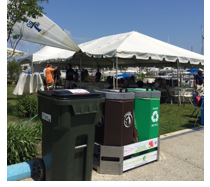 Now we have introduced not only recycling but also composting, when appropriate, and have diverted tons, literally tons, of waste from the landfill (over 23 tons of compostable waste collected from the last two Annapolis Rotary Crab Feasts alone). Planners of regattas, foot races, rowing races, and more, are now coming to us asking for help to Green their events. Our program is designed around a toolkit of resources to make the sustainability initiative as all-inclusive as possible. This is especially opportune as Maryland Senate Bill 781 takes effect on October 1, 2015, requiring organizers of all special events on public property, attended by 200 or more people, and providing food or drink, to have recycling containers located next to each provided trash can. Event organizers also must demonstrate a plan for collecting and recycling. Above and beyond providing all the resources and contacts, we offer solutions for getting the job done. Sponsorship opportunities exist for events that simply don’t have a waste hauling in the budget. Annapolis Green owns and provides the receptacles (our attractive Eco-Stations) that carry sponsor branding. We also provide banners and other signage, as appropriate for the event, thanking the sponsor and congratulating the attendees for doing the right thing. In this way we connect companies with good work and give them credit for doing so. We welcome Weems & Plath as our inaugural Red Right Recycle! sponsor! This type of sponsorship is absolutely unique. It offers terrific exposure along with “doing good” for our environment. Sponsors get double the promotion: From the main event and from Annapolis Green as we tap into our community of environmentalists, residents, government officials and business people with a sustainability values. Some event planners may offer free tickets or other similar benefits to Greening Sponsors. Most offer sponsor logos and links on the event website and inclusion in social media, email blasts and advertising as well as mention in program booklets and other published materials. As an event Greening Sponsor, not only will we promote your business on all Eco-Stations and banners at the event, we will also get the message out electronically through our website, email blasts, social media and weekly radio program. Bin Buy Bin--For those who cannot make a full sponsorship commitment (usually $1000-$2500, depending on this size of the event, duration, and services offered), we have instituted the "Bin Buy Bin" program so that Greening can be accomplished at an event one Eco-Station (and/or compost bin) at a time. Contact us for details. We are carrying out this initiative under the "Keep Annapolis Beautiful" banner as an affiliate of the venerable Keep America Beautiful organization. If you know of a company that might like to be a part of this exciting program, please contact us AND them. 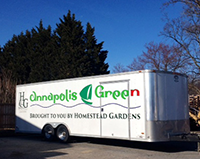 Tell them why you support Annapolis Green, put them in touch with us and we'll do the rest. Also, let us know if you can volunteer to carry out the program at a REF event! We also welcome corporate volunteers who can help us with set-up and break-down at REF events. A REF event could be a great team-building initiative for your company. Is your organization keen on establishing or meeting corporate social responsibility goals? Consider lending support to a local event that resonates with your culture or mission. Join our growing list of like-minded organizations who are taking steps to make the Annapolis Area known not only for its natural beauty but also for its environmental stewardship! Get involved with Annapolis Green’s Responsible Events & Festivals. T h i n k G l o b a l l y • A c t L o c a l l y !